After arriving in Ireland under the command of Robert FitzStephen in 1169, the Anglo-Normans attempted to conquer the island in stages for the next several hundred years. However, at their peak in the 13th century they had only managed to hold around two-thirds of the country and throughout the 14th and 15th centuries the Norman influence diminished until they only maintained effective control of one area of land by 1495. This area was known as the Pale in medieval times and was mainly centered around the Dublin region but also incorporated parts of counties Louth, Meath, and Kildare. 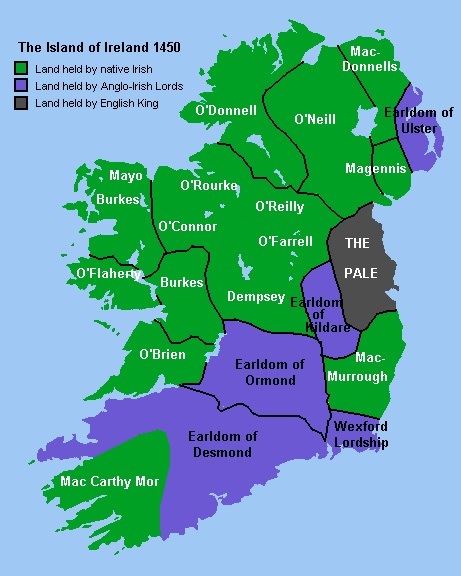 In the Late Middle Ages, the Pale was established to be a kind of beachhead that would remain under direct English rule, even as the rest of the country resisted the Norman invasion and pushed back against the colonisation of the island. The actual boundary of the Pale consisted of intermittent fortified ditches, defensive walls, and banks as well as periodically placed castles and fortresses. The exact perimeter of the Pale was somewhat ill-defined and changeable as there was never a continuous barrier put in place to mark the border of the land; however there were many fortified positions built to defend the colonialists from the native Irish and some of them still exist today. The remnants of the Pale boundaries can be seen in such locations as the ruins of Puck’s Castle in South Co. Dublin, which was designed to keep the ‘wild Irish’ at bay. 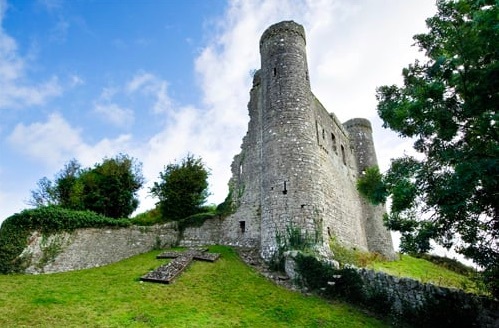 Drimnagh Castle, which still has a functioning moat to this day, was built by Norman Knight Hugo de Berneval around 1240. De Berneval was part of Richard “Strongbow” de Clare’s 1170 Norman invasion of Ireland and was given the land where the castle now stands as a reward for his services. Rathmore in Co. Kildare served as part of a border fortress for the southwest corner of the Pale, whilst further north part of the ‘Pale ditch’ can be seen at Syddan in Co. Meath and the Dunmoe Castle ruins overlook the River Boyne in Navan. The etymology behind the name “Pale” is derived from the Latin word for a stake or a type of boundary marked by fence posts. The phrase “going beyond the Pale” is also connected to this origin, as it was originally a colloquial phrase meaning that a person was going beyond the limits of the ‘civility’ that the Pale supposedly represented and out into the wilderness of rural untamed Ireland. In modern times the name ‘the Pale’ is used as a mostly derogatory way of describing Dublin city, and the pejorative term ‘Jackeen’ which is sometimes used to describe people from the capital city originates from the fact that Dublin was the centre of English rule for centuries, and combines ‘Jack’ as in Union Jack with the Irish suffix for little, thus implying that Dubliners were ‘little Englishmen’. The Pale continued to exist in fluctuating strength and sizes as various English deputies who were sent to oversee the region struggled to understand complex Irish factions and customs with varying degrees of success until the reign of King Henry VIII. When he declared himself King of Ireland in 1542 he sought to reestablish the central authority across the country that had been diminished and had led to the creation of the Pale. The term was gradually phased out as the English influence spread across more of the country during this Tudor re-conquest in the 16th century. 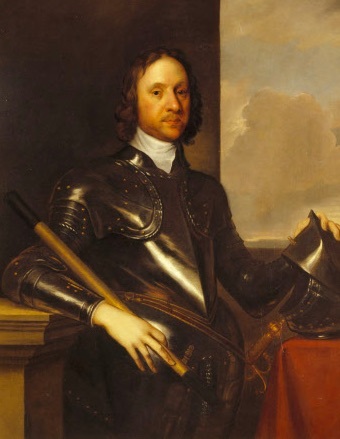 By the time Cromwell arrived in the 17th century he showed no distinction between the Irish who lived in the Pale and those beyond it, although a perceived class culture had developed between those from the Pale and those who were beyond it; this can be seen as a reason for the continued use of the phrase ‘the Pale’ as a somewhat insulting description of Dublin that persists to this day. No matter how much time you have in Dublin don’t skip the Liberties! You won’t be disappointed as the area has a lot to offer including the newest and most exciting tourist attraction in Dublin, Vaults.Live. If you want to hear the best stories about Dublin and Ireland’s rich history, come and visit Vaults Live, it is located right in the heart of the Liberties!